Yesterday, the Drawing London Group had a lovely sunny day out sketching the Olympic 2012 construction site just west of Stratford in East London. It had an extra benefit for me as I got to walk home! 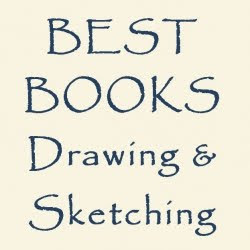 I'm going to show you the four sketches I did in this post and the next couple of posts. 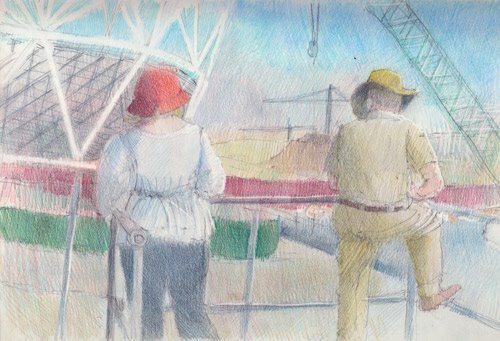 The first one is of two fellow members of the Drawing London group sketching the Olympic stadium and the site of the Olympic Park. However I like sketching people sketching so you only have a bit of the stadium from me - which is also helpful because it means I can cut down on complicated counting of struts! The people also help to give it scale. Plus it's a nice record of members of the group. I do think I might have a bit of a lean on my stadium. I'm OK at knowing my verticals tend to lean but I've not had previous experience of ellipses leaning! Stratford station is a railway station in Stratford, Newham, East London on National Rail, London Underground, London Overground and Docklands Light Railway (DLR) lines. It is served by the Underground Central and Jubilee lines, and by London Overground, National Express East Anglia and c2c. It is in Travelcard Zone 3. The Greenway runs right through the middle of the Olympic site. The main Olympic Stadium is being built on the right hand side. You also have a distant view of other stadia being built within the Olympic Park. If you continue walking up the path beyond the Stadium you get to Old Ford Lock on the River Lea and Fish Island. Of which more in the next post! One of the nice things about the Olympic site is the number of different ways you can walk and cycle to the Olympic Park area from other parts of London. I hope the plans to develop this network is seen to fruition. Sketchercise count: 10,061 steps yesterday - which includes walking home from here! 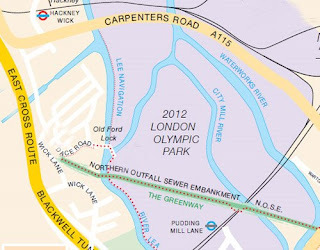 Note: The Greenway is constructed on top of the embrankment which contains the Northern Outfall Sewer which was constructed by Bazelgette after a cholera outbreak in London in 1853 and The Big Stink of 1858. 8,000 steps 3.8 miles 456 calories! Well if I'm going to start counting steps I might as well show you how it comes out! Unfortunately this is the only record I have of the walk on Sunday afternoon and I know I rounded the number of steps - but it was only just over 8,000 steps. This pedometer cancels the count and starts again in the early hours of the morning so I need to learn to write totals down before I go to bed! However I now know the length of my classic long walk which should provide some incentive to do it a bit more often. 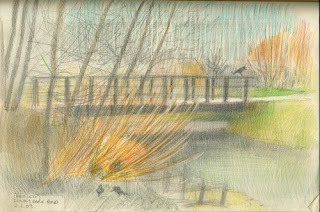 Here's the sketch I did at the pond. Fishing season has begun and the kiddie fishing nets are out in force at the weekends, ably assisted by the Mums and Dads who are enjoying a second childhood. Speaking personally, I always used to enjoy going crabbing as a child - but I need to live a bit closer to the sea for that! Sunday's sketch is not the best designed of sketches as the people sat down to fish after I had started the sketch so I fitted them in the best I could! I think I'll probably have another go at this one as a formal drawing and see what I can make of it. 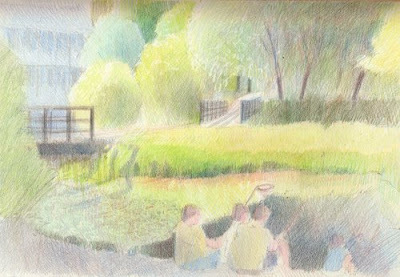 I'm beginning to enjoy the way the sketches and drawings for the Ecology Park Ponds are beginning to repeat in the same way that the photographs already are. Just compare this scene from this one sketched on the 2nd January when I could barely sit on the metal seat because it was so cold. Sketchercise - and my new pedometer! The doyennes of sketchercise are the small group of bloggers who participated in Julie Oakley's One Mile from Home challenge. I was a supporter more in spirit than reality during that challenge. However this year getting more exercise has become a very real goal to reduce the risks of more falls/tissue tears/etc. One of the reasons I started my Ecology Park Ponds series this year was to try and make sure I got more exercise. The walk up to the pond is something that is near enough and far enough to make it a decent walk without making it an expedition or taking up too much time. However if I do have the time it's the start of my four mile walk which also takes in the Regents Canal and both lakes at Victoria Park. Yellow flag irises at East Lake - the "before"
I do however need to sort out my pencils - since the pond 'greened up' this month - see the photos in the May Ecology Park Pond Gallery on Flickr. 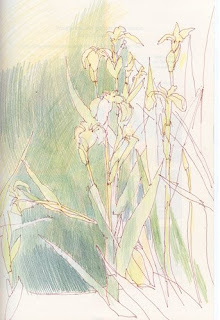 I've been deficient in greens in my pencil case and latterly I've been visually swamped by the development of the yellow flag irises (Iris pseudacorus). I had a bash at doing a sketch of them on Thursday but it needs finishing as I hadn't got the right colours with me. This is the 'before' version! Anyway the point of this post is to say as of Friday I have a new incentive. I've now got a pedometer! It's called the ex3 plus and I bought it an hour after I'd been given a pedometer which I promptly lost because although it was hooked inside my trouser pocket it dropped out! This new one weighs next to nothing and hangs round my neck so there's no chance of losing it! I'm currently 2lbs away from having lost 2 stone since January 1st - which I would have achieved some weeks ago if it hadn't been essential that I went on an official "leg rest with foot up" three week break during the back end of March and early April. 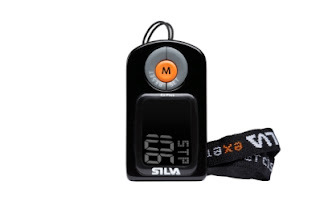 I'm planning to road test the new pedometer this afternoon when we go for our Sunday afternoon walk. What I like about the new pedometer is it gives me feedback about the number of steps, the distance I've walked and, if I program in my weight, how many calories I've burned. That's the sort of feedback I like! You may just possibly see steps counted and distance walked on future sketchercise posts! If you are also participating in sketchercise, just mark your posts with that word as a tag/label/category and I'll find them - or just leave a comment below. 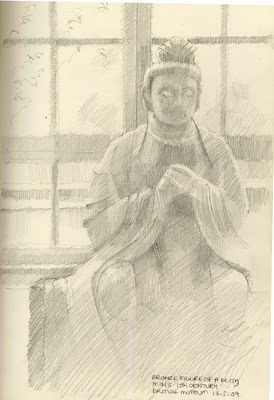 I sketched this bronze figue of a deity in the British Museum on Thursday = against the early evening light from the window behind. 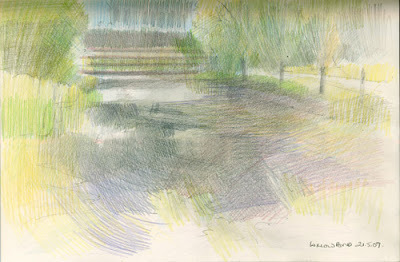 I think I must be having a "contre jour in pencil week" - this makes two on the trot! There are lots of great objects to draw in the British Museum - the range is huge. 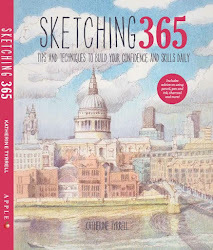 How to find the sketching stools! As you enter the Great Court turn immediately to your right and then look to the rear and you should see a rack of folding sketching stools. They're not the comfiest of sketching stools if you're sketching for a long time but they certainly beat walking around London carrying your own! Yesterday evening as I was making my way back to the tube to return home after my annual check-up at Barts, I found myself drawn to sitting on the steps of St Paul's Cathedral - in blazing sunlight with a blue sky overhead and the sun getting lower and lower in the sky. I wasn't alone - there were a lot of other people with the same idea. I think we had all probably read the same weather forecast about what the rest of this week is going to be like! 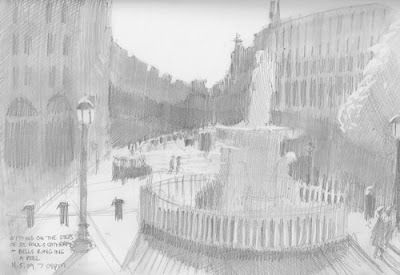 This then is the sketch of Ludgate Hill done from the top step of the steps leading up to the massive Great West Doors which are the entrance to St Paul's. I had the benefit of one the gigantic pillars behind me as a back rest if required. I had the most amazing 'contre jour' (French for against daylight) scene in front of me. The glare from the sunlight removed all colour and rendered everything in black and white and only a few shades of grey. It became a task of trying to detect changes in the blackness and how to render white paint when it was actually in full shadow. This is one of those memorable sketches that I get to do from time to time - which I ALWAYS remembers afterwards - because of its musical accompaniment. In this instance I was treated to the full peel of the cathedral bells at 7pm while I sat sketching! After my visit to the Annual Exhibition of the Royal Society of Portrait Painters this week (see Exhibition review: Royal Society of Portrait Painters 2009), I walked up to the Royal Academy of Arts in Piccadilly to see the Kuniyoshi exhibition. Kuniyoshi was a major master of the ‘floating world’, or Ukiyo-e school of Japanese art, and, together with Katsushika Hokusai (1760-1849), Utagawa Hiroshige (1797-1858) and Utagawa Kunisada (1786-1864), dominated nineteenth century printmaking in Japan. Prolific and multitalented, Kuniyoshi considerably expanded the existing repertoire of the school, particularly with thousands of designs that brought vividly to life famous military exploits in Japan and China. Kuniyoshi developed an extraordinarily powerful and imaginative style in his prints, often spreading a scene dynamically across all three sheets of the traditional triptych format and linking the composition with one bold unifying element - a major artistic innovation. 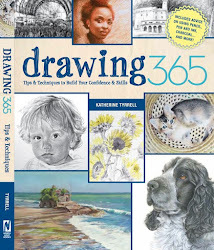 I'll be reviewing this exhibition next week on Making a Mark - this post is just about sketching. Or rather it's about sitting down after you've spent a long time on your feet viewing paintings, drawings and prints in exhibitions! 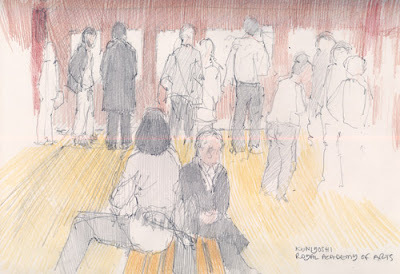 I needed a sit down and chose the end of one of the benches and started to draw people looking at the prints. 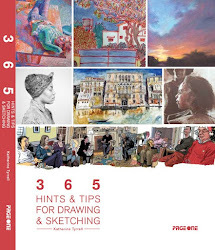 This is great for mastering the 10 second sketch and awful when you haven't done it for a bit - which is why I make myself practice this from time to time. If I've got a good view then I can create a totally fictitious scene - although all the people were in the room and their stance or posture is as indicated at some point. I hasten to add most of the people in the sketch are genuine;y 10 second sketches. If was lucky I got a minute. I had a very rough sense of perspective in my head rather than on paper while I sketched. For anybody wanting to travel with their sketchbook - and walk from the Mall Galleries (in The Mall) to the Royal Academy of Arts, which is at 52-55 Piccadilly, this is the route which I always take which avoids most of the traffic! As indicated it takes about 15 minutes.